A kitchen is like the engine on a car; it drives the house. We spend a lot of time in our kitchens preparing meals, making cups of tea, baking bread and biscuits and when we invite visitors into our homes, we often sit at the kitchen table deep in conversation. Kitchens are where a lot of our home production takes place so it makes sense to keep our kitchens working at their best. Despite what many of you think, I am no angel. Like most other people, when I'm in a hurry I take shortcuts, I open packets and don't put them straight into a container, I don't look properly for ingredients and sometimes have two jars of the same thing and I don't put things back exactly where I took them from. I am guessing you know where this post is going. I'm talking about pantries and keeping them clean and tidy, but this post has an added bonus - it's also a challenge! BEFORE - What a mess! Before we carry on, let me say that my pantry is in my kitchen and it's where I store all food that I am currently using that doesn't have to be refrigerated. My stockpile cupboard is just around the corner from the pantry and it stores all unopened and unused food. 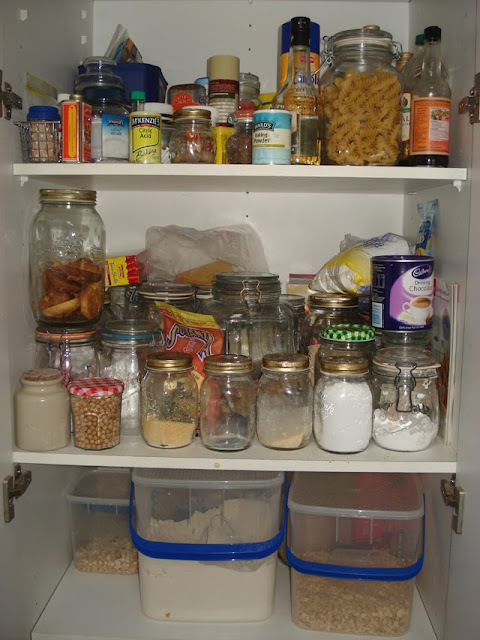 When something is taken from the stockpile and opened, it is put in a container and stored in the pantry. I usually clean the pantry about every three months. We have no major bugs here to worry about and since we started freezing all our dried goods when they're brought home, we've even eliminated the dreaded pantry moth and weevils. I don't stop freezing and using containers just because I see no insects, I know that I don't see them because of the freezing and containers. AFTER - it makes me smile. My pantry was in a really bad state. Despite knowing I should decant everything into its own container, I had a couple of things in plastic bags held tight with a rubber band, I had two jars each of dates and dried fruit and a couple of unopened packets that should have been in the stockpile cupboard. Overall the pantry was a disorganised mess - the result of a busy woman taking short cuts, I'm sure many of you can relate. So I set to work. I emptied all the shelves into the kitchen benches and wiped the cupboard down with warm soapy water to remove all traces of spilt food, and then carefully dried all the shelves. I put back the larger items onto their shelves so I would have more room to work, then started sorting jars into categories and checking I didn't have more than one jar of everything. I made one jar out of the two lots of dates and one of dried fruit. Any jar that were almost empty had its contents put in a bowl while it was washed and dried then the jar was filled to the top. The entire exercise took about an hour and now I'm back to having everything is its right place and the pantry set to help me work efficiently in the kitchen instead of hindering me. It feels good and every time I go into the kitchen I open the pantry door and smile. Unneeded jars, washed and ready to be put away. This is an easy task but its one of the important ones. Having food organised and safely contained will not only help you work, it will keep your food safe and will help eliminate waste. So if you haven't cleaned out your pantry recently, I challenge you to do it this weekend. I am going to start a thread at the Down to Earth forum where we can all post our photos. We may not live close to one another but we can still use our modern technologies to support and encourage each other to work to the best of our ability. I know it's probably not what you want to do on the weekend, but it won't take long and what else could make you open a door and smile at the pantry? I love opening closet and cupboard doors and SMILING! I recently reorganized my laundry closet and find myself opening the door for no particular reason -- except to smile! I have put cleaning the pantry cupboards on the to-do list for my attendant. I found it encouraging to see that somebody else needed to do theirs. I am in a wheelchair with limited use of my arms and so this is one of the jobs that I need help with. I love to see neat rows of jars and cans on my shelves. I have also been slowly replacing my plastic containers with glass. I enjoy reading your profile. Keep up the good work. Thanks for the challenge Rhonda, and good timing. My pantry shelves are in a real mess - each time I have taken out the sugar recently, I have spilt some because the tupperware was not properly closed, and then I have not cleaned up. So thank you, and as I read over posts from 2008/9, I am so enjoying the way you write, and your wisdom and insight. And my dogs are happy because they are no longer being offered 'korrels'! I just left you a note Rhonda and I am not sure if it saved it or not. I was saying that we must be in the same mindset because I just finished cleaning our pantry and lining it with all my canned goods from the harvest. I haven't written about it yet, but I did include a picture on today's post. I posted about this today with pictures of my pantry. This is exactly what I have been doing this week. Pantry, fridge and store cupboard. Yes it does make me smile when I take a peek. Thank you for your post....it was a wonderful reminder that I need to go take care of my own pantry. The job I have ahead of me is not so much tidying and organizing what is in my cupboards (no pantry yet, alas! ), but eating everything that's there. As my partner and I get ready to live in New Zealand for 8 months, it's time to try and use up all the things I've been buying in bulk for so long...I had a look on the top shelf yesterday and realized I'd set myself up with enough baking soda to last two years...well, my friends will get to raid my kitchen before we move out! You must have been reading my mind because I was just looking at my pantry and exclaiming how AWFUL it looks! And to top it off, my pantry is made up of open shelves, so EVERYONE walking into my kitchen can see what a messy state I have let things get. I will certainly be cleaning it out this weekend (if not before). I accept the challenge! :-) Thanks for inspiring me to do something I know will make me feel better in the end! I tidy and organise my pantry ver regularly. Generally after my 3 1/2 year old has decided to start on it! He loves to help me unpack the groceries, and when I don't have any, he unloads the bottom shelf of our very large pantry, and loads it back up again in what he deems to be a more orderly fashion ;) Once I've spent more than 3 minutes looking for something a few too many times, I pull it all out and reorganise. This is a neverending circle, but it's more fun for him than the TV, so I can't complain there! Not long and he can be the chef in the family!! I'm fairly organized, so I usually know exactly where something is and how much is left. But I don't have a very large pantry. Our previous house had a bigger kitchen and the pantry was pretty big. Since I have a smaller one now, I have taken over one of the cabinets that would normally hold pots & pans and keep my flour, sugar, etc. in it. All in plastic containers. I bake a lot, so I go through a lot of flour and so forth. It's just so much easier to be organized. hahahaha! your before is what I would considder my organised 'after'! I have infact been meaning to do it. My pantry is above head hight, and whilst a packet of spaggetti falling on your head doesn't hurt much, a tin of beetroot slices certainly would! Challenge accepted! I'll post the before and afters - do you mind if I link back here? Ha! This weekend I am moving into my new house, so my pantry is getting a VERY thorough cleaning and reorganizing. I get to start from scratch organizing in the new space! You must have been sending out pantry cleaning vibes as you thought about this post Rhonda! Late yesterday the urge to do exactly this hit me, and its is such a great feeling to have it done! We are currently packing up our little unit to move into a HOUSE (with a yard and gardens, I'm so excited! ), and the house we are moving to has a tall pantry just a bit skinnier than yours Rhonda so I will certainly be cleaning and sorting my pantry in the next week! I like your system with the stockpile cupboard then transferring everything to the pantry once opened. I must get into that habit. Pantry moths are a bit of problem at the moment but we are starting to be very diligent about the freezing of dry goods first. Thanks for the pictures Rhonda, very inspiring! Clean and tidy is not my forte! But I do really agree with the idea of decanting opened dry goods into storage jars. 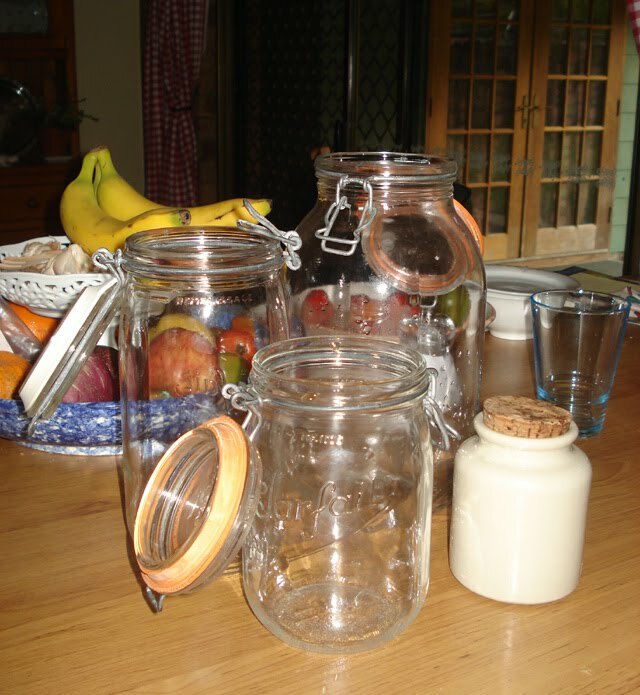 I have a collection of large glass jars - about 2 litre capacity - and I tip everything into them to store. They're safe from all the many kinds of creatures that keep trying to set up home in our poison free rural house, and I can easily see what I have, what needs using, what needs replenishing. We run on solar power, so I don't have a freezer. But I find using glass jars I remember to use things up while they are fresh, before the weevils etc get a go on. I also think it has a subtle effect in helping me avoid getting lazy about rejecting excess packaging - I know I'm just going to tip it into my jars anyhow. I agree that you must have been sending out pantry cleaning vibes, Rhonda...my main goal for today was to clean the pantry! I also agree with Bianca - your 'before' shot looks like my organised 'after' too! I did just this two weeks ago, and you are right - it made me so much happier! I love having things well organised. I also organised my freezers (I have two). It was such a good feeling. I reorganized my pantry recently. 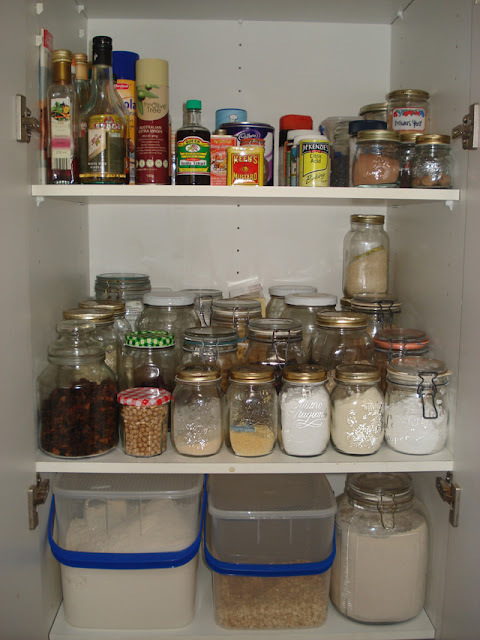 It is a deep and narrow cupboard and it is such a pain to have to pull out jars to reach the ones at the back. I am now using a drawer to hold all the baking supplies and spices and the shelf which held these now holds breakfast supplies. No more expeditions to search for vanilla essence, it is all at my finger tips in the drawer in little baskets. Makes cleaning easier too, not having to take out every individual item. Another pantry shelf is for cups and glasses. The glassware cupboard became my dry ingredients cupboard and jars are now in a single row. So much easier - I just had the mindset that a pantry was for food only and the other cupboards for kitchenware. I also have been on a mission to eliminate all plastic containers and replace them with glass ones. It is only finding a large enough non-plastic air tight container for the bulk supply of wheat grain which is proving a challenge. Did you know you should not store grains on the higher shelves? This is something I only discovered recently but it makes sense as hot air rises and increases the risk of rancidity. Another good tip if you have the room is to organize foods into types as you would use them in your cooking - Italian foods together for instance. I've just not long re-organised my pantry and I am so much more productive for it! Just yesterday I was thinking that my pantry needed an overhaul and today I did it! It took 2 hours and suddenly I have a lot more room for food. Even my 14 mo daughter cooperated and didn't pull anything down on herself or spill flour or pasta all over the floor. Apparently putting a sprig of fresh bay leaves in your flour prevents the little critters from inhabiting your flour - replace bay leaf sprig every 2 - 3 months. I haven't notice that the flour takes on the bay leaf odour too hectically. Hmmm; I thought your "before" picture was an after ... which gives you some idea of why this job has been on my mind lately! Could you expand on what dry goods you freeze? I rent a house with a kitchen that backs onto a very wet old Victorian coal bunker with a connecting door that I keep shut, but still suffer terribly with damp and creepy crawlies in the kitchen; so I'm keen to hear any tips on successful food storage in, shall we say, "challenging" conditions! I'm gonna take that challenge! With a lot of kids, here, this week, my pantry really need it! I think i'm gonna do my fridge too! OK, so I'm sure this sounds goofy, but what I liked about the pictures was trying to spot things that were packaged similarly (or differently) relative to what we see here in the US. Of course the canning jars, and the ones with the glass lids and bails don't identify companies, but I use those too. Good to see that others use empty jars for storage, too. In fact, I have that same one with the red gingham lid. It's really good for storing a cut onion (in the refrigerator) because of the wide mouth. When purchasing a food product, I consider the container as well as the price and quality. If I can re-use the jar, then I get two-for-the-price-of-one: food product+storage container. However, in the same spirit as your truthfulness, I'll admit to having been slack last year and had ceased putting new purchases into jars. Then we had a mouse invade our cabinets. I probably lost $50.00 worth of food before I discovered the problem (I don't have a pantry so my food storage is almost all over the counter-tops). And as Musical Maggie said, I also am trying to use glass instead of plastic. I cleaned both my pantries again Monday evening and does it ever feel good. Sunday after coming home from a trip I bought groceries and I have begun the stocking up for winter (buying a few extras each time and canning). I noticed I needed to reorganize. Having a disorganized mess is hard to work around. I find I have to do this every couple of months because when we are in a rush to cook or store food we don't always put things where they belong. Rhonda mine's a mess and it needs attention. My weekends are too precious for this challenge but I will do one shelf a morning before work next week, Thanks for the challenge! For the bugs control, have you tried keeping 4-5 fresh Curry leaves in the flour or lentils or pulses that you store. This is a traditional method that we use in India and i have been doing it for years now. Never been troubled by bugs or worms. I am not sure if you use Curry leaves in food preparation, but here we use it a lot! I'd be happy if my pantry looked like your "before" photo. I could never envisage it looking like your "after".